The Queen of Neo-Soul, Erykah Badu is set to take her Badu Vs Everything World Tour to Asia. In a social media announcement earlier this morning (7/3), the singer-songwriter added more dates to her global tour, which includes stops in Europe, North America and Asia. The Grammy-award winner was last in Southeast Asia in 2012, when she performed at the Java Jazz Festival in Jakarta. She was scheduled to perform in Malaysia in the same year but was banned by the local government. 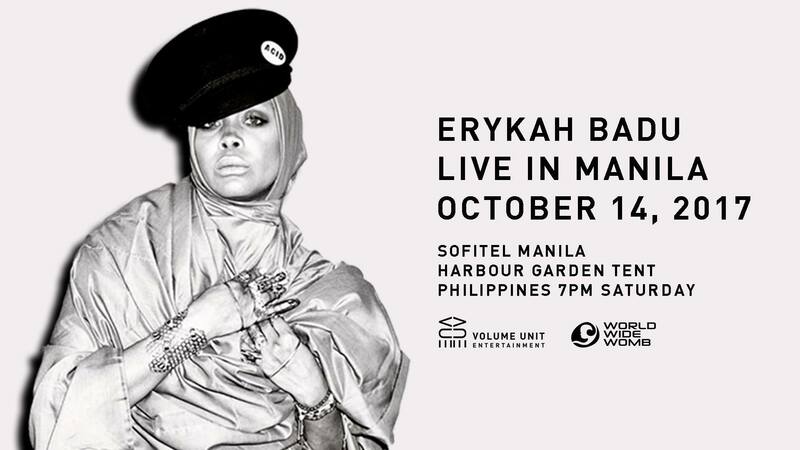 UPDATE: Erykah Badu Live in Manila is happening on October 14, Saturday in the Harbour Garden Tent at Sofitel Manila. Tickets go on sale on August 1st. Limited Early Bird tickets for Erykah Badu Live in Manila will be available via the event & Malasimbo Facebook pages from August 1 to 7. Get tickets here. For those flying in for the event or would also like to make a staycation out of it, Gig Life Asia packages which include concert tickets, hotel accommodation, f&b discounts, and more are available here.